If you’re still toying with the idea of becoming a Street Fit® Instructor, but haven’t yet convinced yourself to sign up, what’s stopping you? We’ve decided to put together a list of the most common reasons why you might be stalling and submit them to a reality check. If you’re currently enjoying a brilliant career that you love, and putting every spare moment into it, then fine, we understand why booking a Street Fit® Instructor’s course is not top of your priority list. But if your definition of being too busy is working every hour under the sun in a job that is tolerable (at best) in order to pay the bills and put food on the table then you need to start creating the time you need to change that situation. Street Fit® Instructor’s courses last one day – ONE DAY! No matter what their circumstances, everyone is entitled to a day off every now and then. Look through our list of courses and find the next course in your area and make sure you book it off – perhaps swap a day with a colleague. Once you have your Street Fit licence under your belt, you may need to put in a bit of extra effort at first – just to get established. Are you a morning person? Consider starting off teaching early morning classes (for customers who like to exercise before work). If you’re more of a night owl, start an evening class. You may not be able to kick the day job straight away, but the extra income should help you trim down those work hours, while the extra energy you get from being Street Fit will help you make the most of your time. Would you make sure your house was spotless before hiring a cleaner? Of course not; so why do you think you need to be slim and toned to do a Street Fit workout? Street Fit is for everyone, not just those who’ve attained a high level of fitness (although if you want to marvel at some of the results, our Instructor’s courses are the place to come!). People of all shapes and sizes come through our street dance fitness program and you can do it too. If you are out of practise and feeling a little daunted, rest assured. You won’t be judged and you almost certainly won’t be the only one in the room. 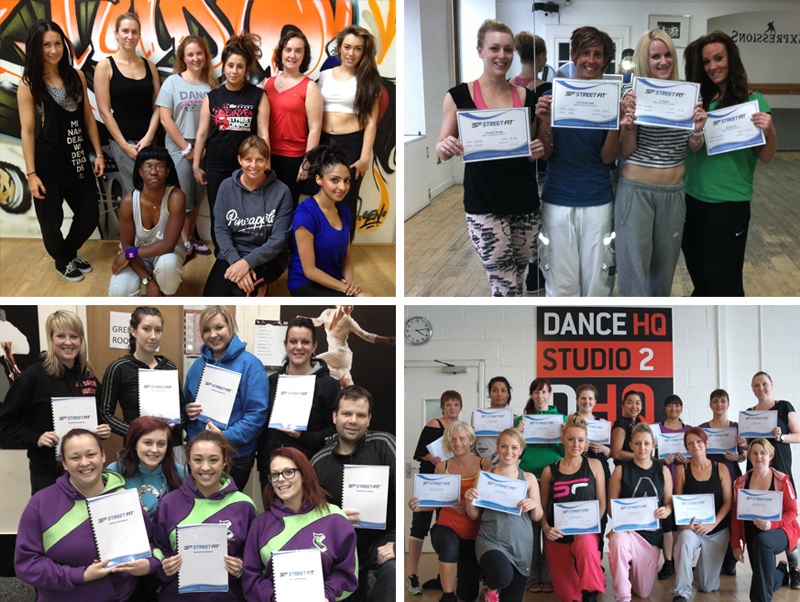 While it’s true that it usually takes money to make money, in the dance fitness industry it usually costs a lot more money to launch a career than our modest £285 Instructor’s course fee (try adding another zero for a typical franchise). Could you do a bit of overtime at work? Is there a luxury you could do without for a month or two? Will friends or family lend you what you need? Your course fee is an investment in your future and will quickly be recouped when you start filling your classes. Doing anything new is going to be a little bit scary, but if we never push ourselves we will never change. Acting confidently will make you feel confident, so instead of worrying that you don’t know anybody, use that fact to indulge in a bit of play-acting (this really does work!). Before long, the upbeat atmosphere of our Street Dance Instructor’s Course will banish those early nerves and leave you wondering what all the worry was about. Street Fit isn’t breakdancing! There are plenty of other fun and funky hip hop moves that can be incorporated into a Street Fit workout. Besides, learning any skill has to start somewhere so don’t give up on yourself just yet. There could well be an inner ‘B-Boy’ (or girl) waiting to come out. I’m Too Old to Street Dance! As long as you’re fit enough to exercise, you’re fit enough to learn a Street Fit routine (just check with your GP first if you have any doubts). And don’t buy into the myth that losing weight will make you frailer as you grow older. Evidence shows that regular exercise helps you enjoy better health in old age, including improved strength, co-ordination and gait. There are no pre-requisites to attending a Street Fit Instructor’s Course (although you have to be 18 or over). The fact that you’re on this page is probably enough to indicate that you would benefit from registering. That’s easy! Just scroll to the bottom for our list of upcoming courses. You can become a Street Fit® Instructor by completing any of our training dates coming up.